The project of the new headquarters of the Unipol Group in Milan, by Progetto CMR , is part of the old "Isola -De Castillia" Integrated Recovery Plan of 2006, located near the Porta Nuova area, considered one of the more relevant redevelopment interventions in recent years as a perfect union between Milanese identity and European vision. De Castillia 23 brings back to life an old building that has remained unfinished and abandoned for years, thus returning to the city of Milan a place that is at the height of innovation and contemporaneity that characterizes the surrounding context. The building remained incomplete at the time of the assignment, develops into two bodies arranged in a "V": the lower one is used as a recreation room and offices, while the tallest - which has 13 floors above ground - has exclusive destination offices. In addition to the completion of the building, there is a general restyling operation: opening the building at ground level creates a connection between public and private, between city and interior; the new covering recalls the compositional themes of the Milanese fairs of the immediate post-war period; the double-height hall reinforces the representative character of the building. The architectural solution proposed by the Milanese integrated design company is a 360-degree intervention, which aims not only to revolutionize the purely aesthetic aspects of the building but also and above all to increase its functionality, energy performance and overall efficiency of the building. 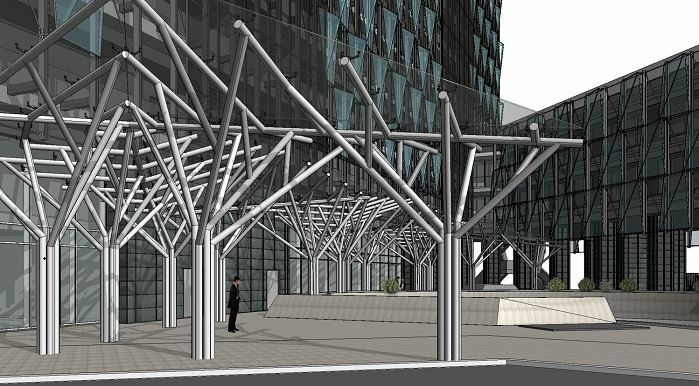 The design and implementation process took place entirely in the digital environment thanks to the will of the client who believed and invested in the benefits of the BIM approach, thus imposing the method to all the actors. 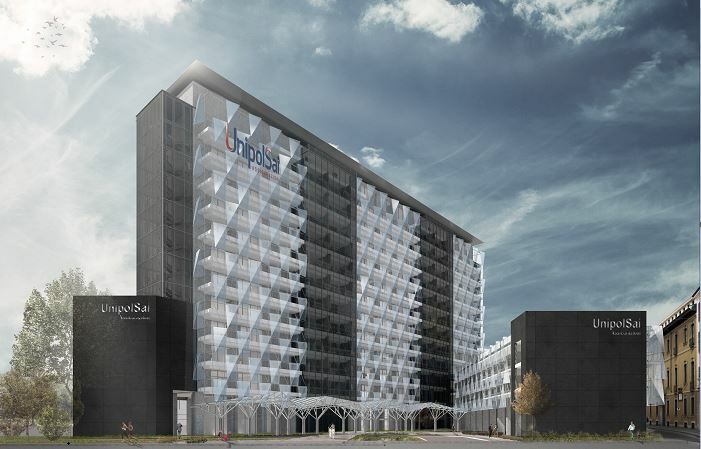 UnipolSai has seen in the Porta Nuova project the possibility of creating a BIM prototype for the management of real estate assets to be repurposed on a large scale. A path of collaboration and sharing of ideas has been started with the aim of creating a new standard and setting up a model that aims to ferry the project through all its phases until it is put into use and put into use. 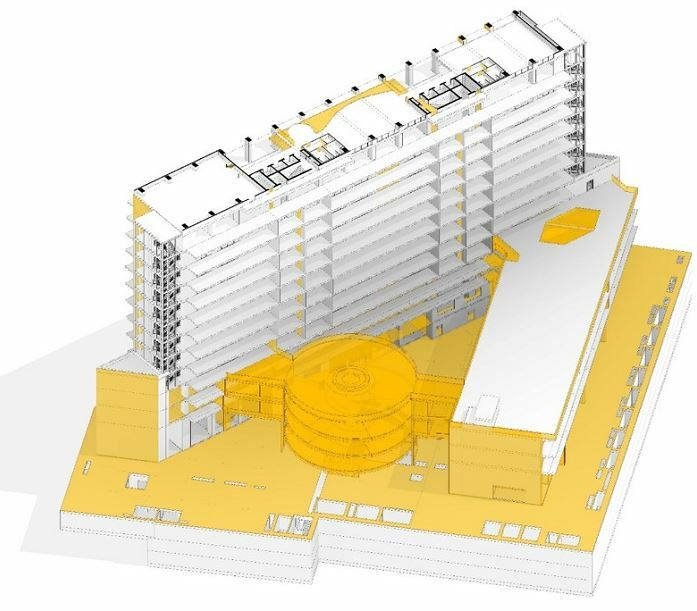 A roundtable among the subjects involved contributed to the writing of the BIM process starting from the client's objectives and translating them into BIM uses and subsequently into LOD. At the same time the BEP was drafted which, to all the previous information, adds an advanced coding system through the automated compilation of specific parameters, so as to link the model objects to the calculations and price lists, specifications and specifications, and then already prepare the files for the update as built by the company. A further step forward was made by setting the CObie parameters on the indication of the facility/asset team on all those objects present in the models and which are expected to be included in the future management program. One of the purposes of using BIM was to manage the project and the site by exploiting the benefits offered by the digital world. Since it is the completion of an existing building, with demolition works that are also complex to carry out, the state of the art has been completely digitalized and various methods of execution have been studied. By virtualizing the process and parameterizing sensitive data, the choice of the demolition sequence was made by objectively comparing the results of different scenarios. 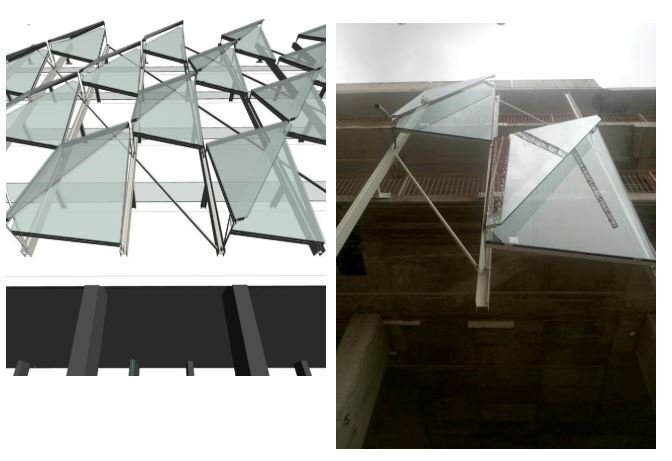 For example, one of the most important choices made by the client and which characterizes the project was that of transforming the first two above-ground floors previously used for parking into office use, with the consequent demolition of the existing access ramp. 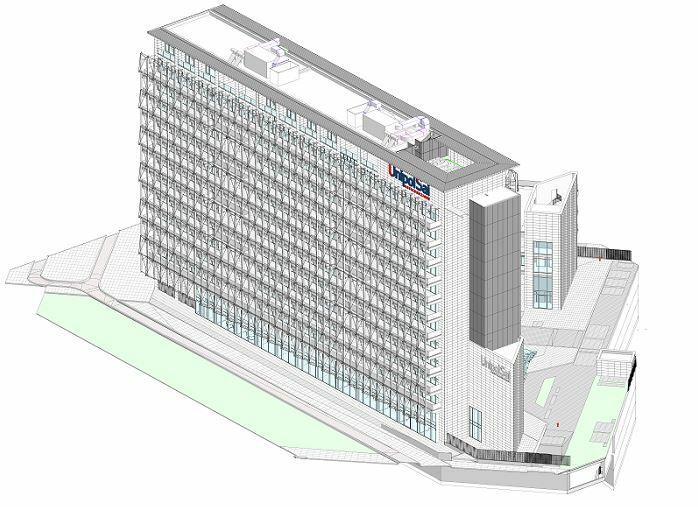 This project boasts an exemplary process in which each phase has found specific BIM declination. The structuring of administrative practices appears to be among the activities that have had the greatest benefit in terms of efficiency thanks to the inclusion of some automatisms that have eliminated the consumption of time in repetitive activities such as the measurement of areas and the re-verification of aero-illuminating relationships. Today's design challenges the boundaries of traditional geometry and is looking for ever more complex shapes. The innovation of building materials and construction technologies makes possible realizations unthinkable until a few years ago. 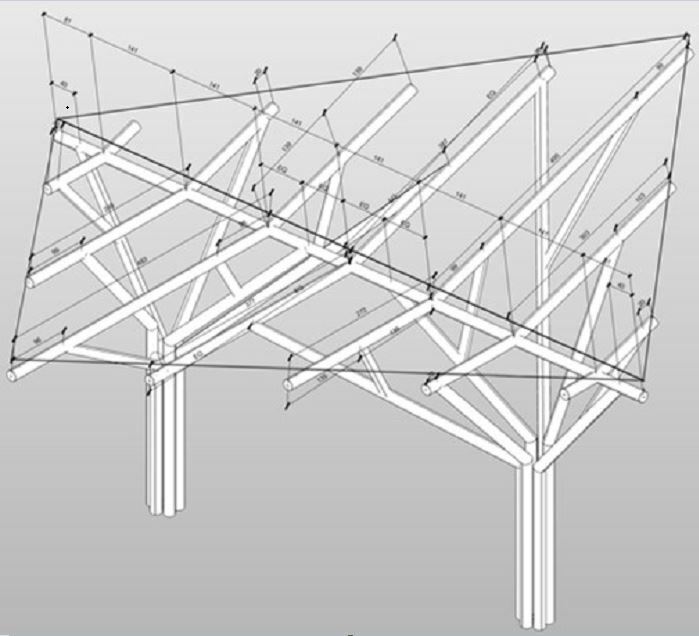 Finally, computational modeling for adaptive elements allows to manage these forms in the design phase and to evaluate different options, combining, in a mix of parameters, constructibility and aesthetics. In De Castillia 23, a strongly qualifying element is the façade, sewn on the building like a precious glass fabric that gives back different light effects depending on where you look at it. A prismatic, dynamic and elegant façade, which communicates with neighboring buildings, fitting well into the architectural language of the district. To achieve this, multiple options were studied and compared through measurable criteria. The possibility to view the different coating options on the same file on the virtual model, in a simple and instantaneous way, has guaranteed excellent image communication to the client, favoring immediate comprehension without the need to realize additional renderings. Even in the construction phase, we have benefited from the advanced modeling that allowed us to achieve almost realistic results. Last but not least, the work management process used a shared environment for the exchange of material, thus avoiding the inefficiencies typical of traditional communication systems: the different subjects had at their disposal, at any time, material updated and shared in a secure virtual environment accessible at different levels. The De Castillia 23 intervention represents the city of Milan in its role as an international center: BIM, image, innovation and sustainability were the key words of the entire creative process.